The Colour Tsars have got in there again. 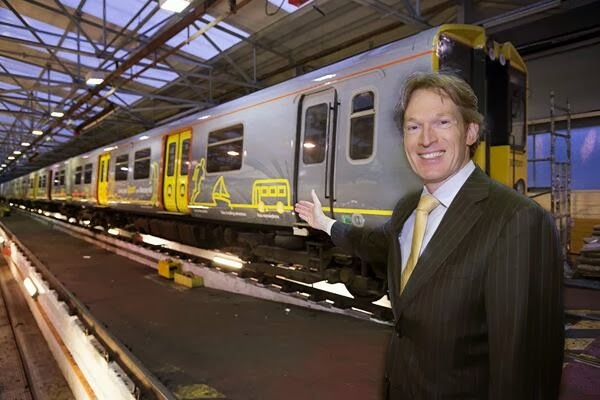 Yesterday, Maarten Spaargaren unveiled the new look for Merseyrail trains. You'll be unsurprised to hear they're going to be yellow and grey. 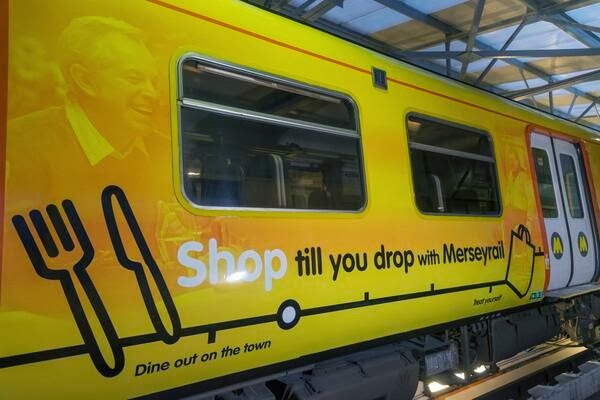 The trains have been wrapped in vinyl to allow a series of designs that plug the wonders of Merseyside - or, as the Merseytravel press release puts it, "the Liverpool City Region". That'll cause a few pursed lips in Meols. Is that Jeffrey Archer above the knife? The vinyl wrap is becoming more and more common as a way of livening up the exterior of trains and, incidentally, bringing in advertising revenue. There are a number of Northern Rail trains featuring pictures of local attractions - the York skyline, items from art galleries and museums - while Merseyrail already has its Beatles Story train. No word on whether that's disappearing. The vinyl's also been used to enable companies to plug their product to innocent passengers. I won't hear a word against this practice, because it resulted in East Coast's really quite amazing Skyfall train last year. These designs are far simpler for Merseyrail, far more abstract, which is good because you're going to be seeing them every day. You really don't want some nightmare inducing laser printed horrorshow pulling up to the platform for your commute of a morning. Hopefully these transfers will last better than the Merseyrail Ms of the last refurb, many of which seemed to fall off the trains and never get replaced. The whole fleet should be finished by early next year, with a refresh of the interiors following soon after. All this is just a stopgap to keep the trains running until they're replaced towards the end of the decade, but it's nice to see them pay some attention to keeping the existing rolling stock from looking tired.